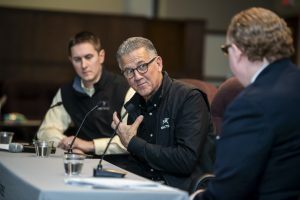 What you missed: Family Business owners from all over the area gathered at Saint Joseph's University to hear CEO of Herr Foods Inc. Ed Herr discuss some of the major life and business lessons he has learned over the years. Ed's comments were followed by insight offered by his nephew and VP at Herr's, Troy Gunden, on how the next generation should handle themselves in the family business. Major Takeaway: Ed stressed the importance of caring for your people. LOVE is what makes a great leader - love of yourself, love of your work, and love of your people. View photos from the event here. What you missed: Our members-only lunch & learns are intimate, workshop-style sessions designed to stimulate peer-to-peer learning and discussion around a family business topic. Major takeaway: Beyond the numbers and reported metric, the intrinsic value of your business, while hardest to measure, is most important as the foundation for growing your business. What you missed: Our open houses are a unique opportunity to spend an hour networking and connecting with other local business professionals, as well as hear a brief presentation on a topic that can better your business. This year's program featured a special presentation on data visualization and how it can transform analytics and everyday decision making. Major takeaway: Data visualization is merely a tool to more easily present and digest collected information. It's the questions that you ask and the context that you assign to the data that improves the conversations and can lead to better decision making within your organization. Experts: Dr. Kathleen Campbell Garwood, Assistant Professor of Decision & System Sciences at the Haub School of Business, and Corey Jones, Senior Financial Analyst and Data Visualization Expert at Johnson & Johnson. What you missed: This seminar focused on a topic that can make or break family businesses. With two presentations on proper techniques for guiding difficult conversations and tools for having successful and productive discussions, our members were able to gain an edge on approaching these emotionally-charged situations. Our members were also able to engage in conversations with each other and share individual experiences they have encountered and give insight into what has worked and has not worked in the past. Major takeaway: Communication and transparency can make a world of a difference. Take note of your triggers and your assumptions prior to entering into a difficult discussion. Experts: Brian Brogan, Director, the Initiative for Family Business and Entrepreneurship, and Delores Mason, Visiting Saint Joseph's University Faculty. What you missed: An in depth discussion on the various aspects to consider when selling your business to the next generation. This program featured a panel of family business owners, each at different stages of transition. Major takeaway: Planning ahead for transition is imperative to the success of the business from generation to generation. Our Spring Family Business Legacy event was an evening spent with David Lipson, Chairman & CEO of MetroCorp, publisher of Philadelphia magazine, one of the oldest magazines of its kind. David shared the history of the magazine and his experience coming up in the family business working under his father. View photo gallery. Our Dine with the Dean, hosted by the Erivan K. Haub School of Business Dean Joseph DiAngelo is an exclusive, invite-only breakfast occurring only once a year at Saint Joseph’s University. 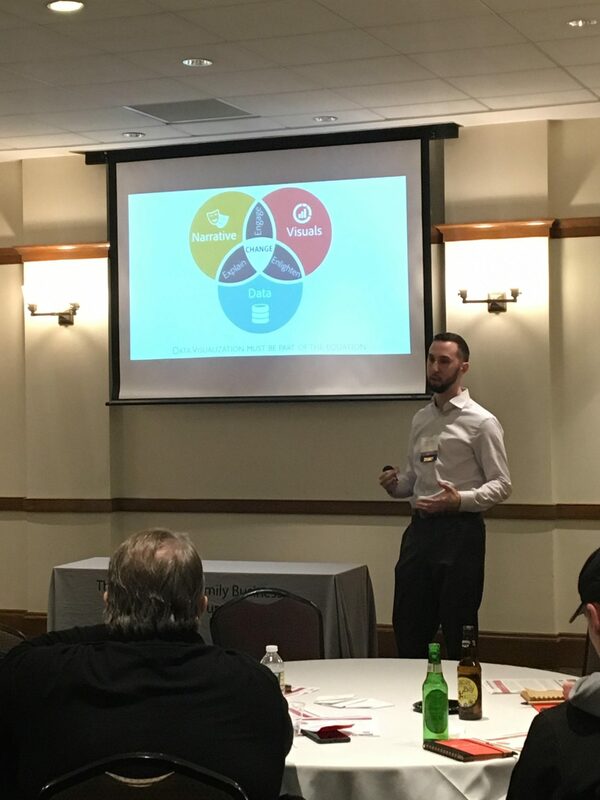 Our second annual event featured F. Scott Addis, author of "Summit" and CEO of Beyond Insurance, who shared how to differentiate your business to reach peak performance and profitability. View photos. Business transition is one of the most challenging issues for a family-owned business. Second to growing the business, having a successful succession plan keeps most CEOs up at night. 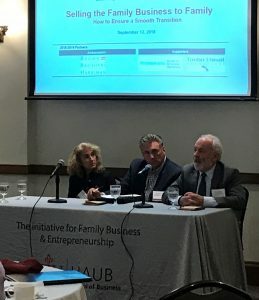 The IFBE team along with experts from Brown Brothers Harriman and Ken Baker, Reshma Moorthy and David J. Friedman had three conversations about transitions in family business. Photos from event. Family meetings are an excellent opportunity for members to foster trust, educate, keep balance, allow for open communication and bridge generations. However, family meetings can also be a source of anxiety and concern for many families. Join us for our next members breakfast seminar as we dive deep into the mechanics of family meetings, address your concerns and provide a process to start implementing family meetings today! View photos. This year marks the 20th anniversary of the naming of the Haub School of Business at Saint Joseph's University. The IFBE joins a week-long celebration with a lecture and the presentation of our Family Business Legacy award to Christian Haub, co-CEO of Germany-based Tengelmann Group, one of the world's largest family-owned and diversified retailing companies. View photo gallery. An advisory board provides the experience and external perspective to help family businesses solve problems and identify opportunities. An effective board is all about guidance, not governance and the composition of your board should complement the knowledge and skill set of the owners. Join us to hear insights and best practices on how to recruit, manage and leverage the skills of your advisory board. View photos. Ownership transition can be difficult. Let us help you evaluate and consider 3 options for successful continuation of your business - succession to the next generation, sale to a third party and transition to an ESOP (employee stock ownership plan) - as we discuss and debate these transition strategies. View photos. Robert Louis and a team of partners at Saul Ewing LLP will present the essentials of estate planning for family businesses. All family members in the business will not want to miss this informational session, packed with useful tips and action items to start your planning process now. View photos. May 23, 2017: Open House - Innovation or Extinction! Family Business & Entrepreneurship Executive-in-Residence and serial entrepreneur, Marc Kramer will present on the topic Keeping the Business Relevant while Maintaining Family Harmony. Don't miss out on this special opportunity to network, learn about an exciting topic, and discover what our community is all about. View photo gallery. Hear case studies and best practices for effective change management focused on transition strategies for both family business founders and future leaders. The examples will spark innovation, move the family business forward, and ultimately lead to greater progress and profitability. View photo gallery. Our Dine with the Dean, hosted by the Erivan K. Haub School of Business Dean Joseph DiAngelo is an exclusive, invite-only breakfast occurring only once a year at Saint Joseph’s University. Our inaugural event featured Jeff Grimshaw, author of "Leadership without Excuses" and a partner at MGStrategy, who shared how he helps senior leaders align people, strategy, and culture in pursuit of business results. View photos. Join us to hear Bill and Emilio Mignucci, 3rd generation owners of Di Bruno Bros., as they share how they have grown the business to become one of the most recognized specialty food retailers in the country, while still preserving the legacy built by Danny and Joe Di Bruno over 75 years ago. View photo gallery. Here’s your chance to run through an all-things-legal playbook with expert tips and advice from a pair of partners at Conrad O’Brien with over 60 years joint experience. Walk away from this 45-minute presentation with actionable items that you can put into place right away so you can focus on your business! View photo gallery. Family conflict in a family business is inevitable; however if managed properly, it can be quite useful. Join us in this breakfast seminar and workshop to explore how you can make the most of conflicts. View photo gallery. Gain high-level insight into encouraging the next generation of leaders to pursue their dreams and work together to build a shared vision as future leaders of the family legacy. 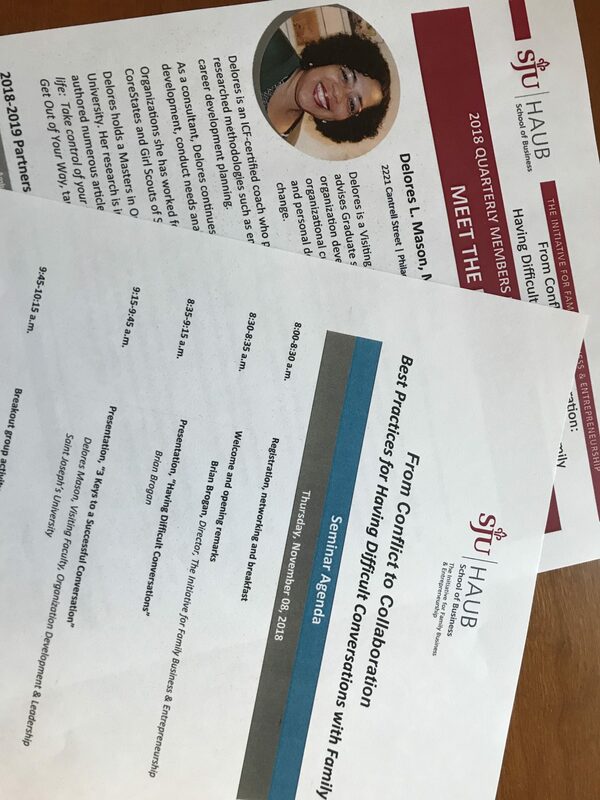 Featured speakers include Meghan Juday, Fourth Generation Leader and Director for IDEAL Industries, and Jill Shipley, Managing Director, Family Dynamics and Education for Abbot Downing. View photo gallery. Get your family business succession-ready with tips and insights from the family with 185 years of successful ownership under their belts —The Yuengling Family! Don’t miss out on this special opportunity for a sneak peek behind the scenes of one of the most successful family-owned and operated businesses in the United States. View photo gallery. Explore how your family business can build agreement among family members by implementing regular family meetings, a family council and a family charter. Fourth generation family members from IDEAL Industries, Inc. and A. Duie Pyle, Inc. will share the secrets to their success in building agreement across multiple generations. Learn how to increase your family's stewardship and leadership capabilities so your family's growth is in sync with the growth of the business. Do you wish that you had a quality sounding board for airing the challenges you’re experiencing in your family business? Join the Initiative for Family Business and Entrepreneurship and your greater Philadelphia family business peers for an evening of networking and confidential discussion. Discover the transformative power of peer-to-peer learning and support by participating in a Peer Advisory Group (PAG). How do you preserve your family’s wealth from one generation to the next? How do you prepare your next generation to receive wealth and be a good ambassador? How does your family define wealth? If you sometimes wrestle with questions like these, then we invite you to join us for our upcoming family business lunch seminar where you will be challenged to think beyond the traditional definition of wealth and what it means to truly leave a legacy for future generations of your family. So you've successfully transitioned the family business to the next generation of leadership. Now what? The struggle to find continued purpose and meaning in your life after transitioning out of the family business is real and can feel overwhelming. This workshop will explore this often neglected topic. Families are encouraged to attend together to help develop whole family strategies that support these entrepreneurial and dynamic leaders in their transition to the next phase of meaningful and purpose-driven work in their both their families and communities. What makes for a sustainable family business: Communication,Transparency or Inclusiveness? Or are all three equally important? Join us as we explore how a deliberate focus on these factors help lay a timeless and lasting foundation for sustainability, both as an innovation-driven business and as a legacy for generations to come. We will reveal the secrets to sustainability by exploring case studies of families that have been successful. Your family will have an opportunity to identify communication and inclusiveness strategies that will help manage and reduce conflict within your family business. February 24, 2015: Leadership Series – Marketing your “Familiness:” Why your marketing strategy needs a “Familiness” upgrade. Why do firms like Columbia Sportswear, Enterprise Rent a Car, and Marriott highlight the fact that they are family-owned? Because they know that “Familiness” engenders customer loyalty. Join us for a discussion of how to upgrade your marketing strategy, and how highlighting the fact that you are a family-controlled firm can help create provide a potential marketing advantage. Ownership and management transitions are never easy. Many senior generation leaders hold on to ownership and management too long – destroying trust and motivation in the successor team. Others transition too early – risking the business’ future with a successor who is not ready for the responsibility of leadership. Join us for engaging discussion of transition strategies from our panel of family business leaders from some of the most successful firms in our region. These leaders have transitioned successfully, but all have battle scars from which we can all learn. October 23, 2014: Leadership Series – From Entitled Brat to Empowered Leader: How great family businesses build a culture of meritocracy and address the cancer of entitlement. September 10, 2014: Leadership Series -"Enterprising Families"